This is a favourite Thai barbecue recipe made for Thai commuters. The enticing aroma of the sizzling meat on the grill or skillet makes it very popular with the street vendors' customers. Ingredients: Sugar Salt, Hydrolysed Vegetable Protein (Soybean, Maize, Maltodextrin, White Pepper (12%), Garlic (9%), Soybean Oil, Anti-Caking Agents (E551, E341(iii)). 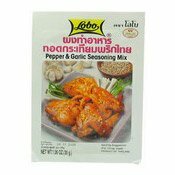 Simply enter your details below and we will send you an e-mail when “Pepper & Garlic Seasoning Mix (胡椒蒜香調味料)” is back in stock!